This month we really have a mixed bag of articles. There should be something in it for everyone. The first few editions were theme based, but this is not the ideal structure of a magazine, as themes will run concurrently over a few issues, making an overlap of themes inevitable. Also, the magazine is a collaborative one and different authors have different strengths. By leveraging the strengths of contributors, you, the reader, will have a better variety of topics in each edition. This will make the magazine more enjoyable and give you a better, holistic view, of Mind Mapping. 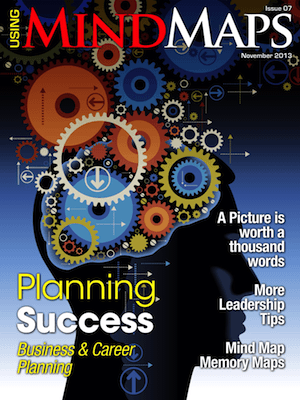 This month covers Mind Mapping Principles, Business Planning, Career Planning, Memory, Leadership, and more. ’… The mind mapping laws are sometimes restrictive, squelch creativity and/or do not add value to your map. It’s important to understand the laws, but they should be used as guidelines that can be disregarded based on the purpose of your mind map. ’…Felicity is a business planner in the risk-management department of a medium-sized software company. She is responsible for performing risk evaluation and business impact analyses to adequately plan for potential financial threats and other disruptive circumstances. She is continually developing and revising business continuity strategies, emergency response policies, and operational business plans to deal with these possible circumstances. This article has the Mind Map that Liam used in his presentation, a Video of his opening address and a ‘live’ Mind Map of his speech taken during the presentation. Hans Buskes gives an interesting talk on what he labels ‘Mind Mapping 3.0’ and covers semantics and the importance of making Mind Maps that can be read in the future. Will your Mind Map be understood 600 years from now? ’…Every leader knows that the only constant in business environment is change. The key to successful change management is to get people to work together and build an environment of trust. Social Neuroscience explores the way humans relate to each other and thus for leaders it can help them understand the social behaviors that will make people either collaborate or not collaborate. ’…While I have not developed a photographic memory, I have developed the incredible ability to remember whatever I want to remember with the use of Mind Map Memory Maps. I have to put some effort into recalling what I have worked so hard at putting into memory, but I will be able to recall the information when I need it. In other words, I have learned memory techniques to recall at random any piece of information that I chose to put into long term memory. ’…Career planning can benefit greatly from mind mapping, because it enables you to view multiple perspectives and possibilities in a compact, visual format. Get tips, tools and techniques from the world’s leading Mind Mapping Experts.